Google is an internet company and the firm is building all the things that are required to connect to World Wide Web. First it was the web browser – Google Chrome, then it was an internet providing service – Google Fiber and now it’s a router named OnHub. Google’s new router is reportedly very easy to set up and manage. The device also has the ability to be a smart home hub as it can connect to other smart home accessories. OnHub is a cylindrical tower and looks quite similar to Amazon Echo – but both the device have different functionality. The unique selling point of Google’s router is its ability to connect to Android smartphones through an app and inform users about the connected devices to OnHub and also provide details regarding the speeds each of them are getting. According to Google, OnHub’s circular design will allow the router to have better penetration in a house. The router supports 802.11ac and 5 GHz Wi-Fi band. OnHub can automatically detect the best channel to broadcast on. Google has built its new product in association with TP-LINK. 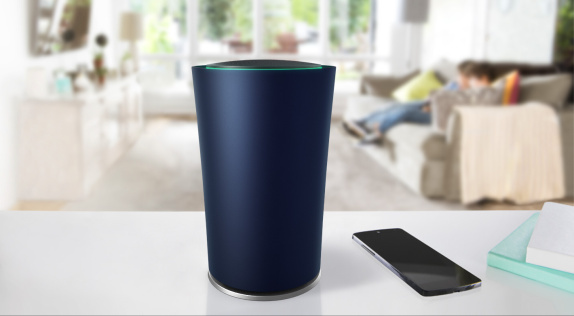 Google is promising to bring new features to OnHub via software updates. While the firmware updates are usually a pain to install on a router, OnHub is said to have a unique ability to handle them automatically. OnHub brings Bluetooth LE on board and supports Google’s smart home language, Weave. Google’s latest product is powered by a Qualcomm chip, which is quite surprising considering that this segment is largely dominated by Broadcom processors. You can check out the source link below for the detailed hardware specifications of OnHub. Google also plans to design new OnHub devices with other hardware partners in the future, but the company has confirmed that their second partner will be ASUS. OnHub is priced at $199.99 and will be available for pre-ordering starting today in the Google Store, Amazon and Walmart in the United States.